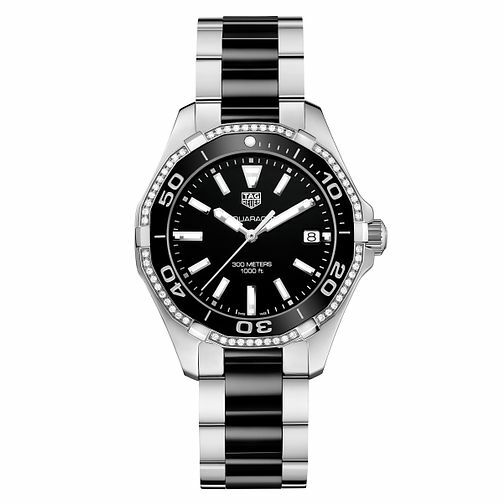 From the iconic Aquaracer collection by luxury watchmaker TAG Heuer, this exquisite Swiss Made timepiece features a brushed and polished stainless steel case and two-tone bracelet to bring together the sleek case and bold black dial. This ladies' timepiece features a bezel complete with no less than 60 diamonds, set to stylishly shimmer. The sophisticated dial boasts luminescent markers, date aperture at the 3-o-clock position, classic logo branding, and with a water resistance of up-to 300m this makes for the ideal watch for the woman who demands more from her accessories.